National Temporary Solutions provides and delivers hoarding to a wide range of clients in various industries all over Australia. 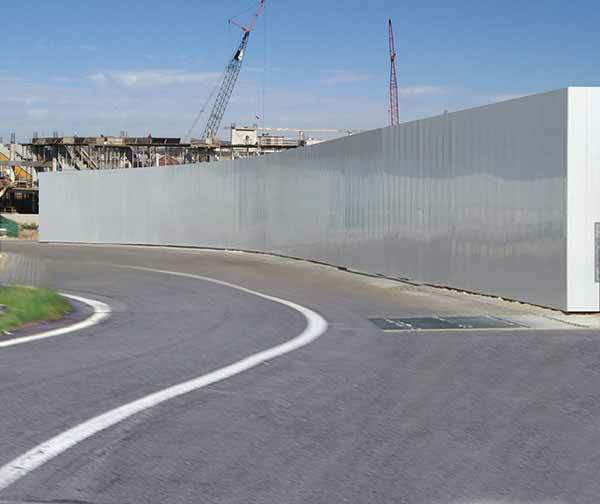 We provide highly configurable hoarding panels that are easy to install and usable in a wide variety of situations. Lightness – Our hoarding panels are made of lightweight material and are designed to be easy to install and configure. They are versatile enough to suit a wide range of environments, and are also suitable on corners and able to accommodate recesses. Stability – Stability is of the utmost importance when it comes to hoarding, and our panels are designed to be as safe as possible. Supports made of fabricated steel ensure stability even in inclement weather. Ease of transport – Our lightweight panels can be transported via pick-up truck, making them an environmentally friendly option. Attractiveness – We understand that your corporate identity is important to you and hence have designed hoarding that looks attractive and maintains a professional image. We offer a range of branding solutions that enable you to broadcast your corporate identity on hoarding panels. Reusability – In the interests of the environment and cost-savings for our customers, we supply recyclable hoarding. These panels can either be transported to a warehouse and then reused, turned into new panels or transformed into other plastic products.